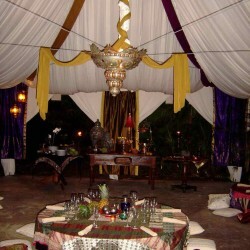 NGALA presents the finest in unique and memorable facilities for your special Wedding, Corporate or Social Event. NGALA® creates the perfect destination for Corporate Retreats, Weddings & Receptions, Team Building Events, Product Launch Parties and Major Social Celebrations. 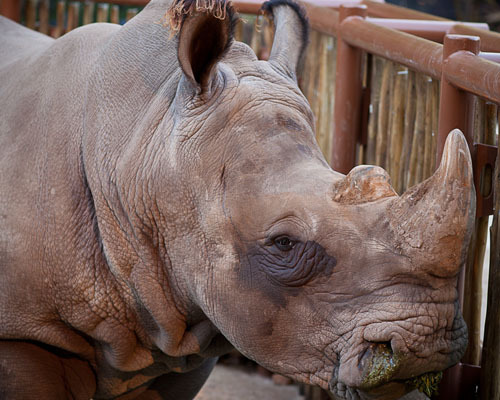 In addition to contributing to the daily care and maintenance of the animals, events hosted at NGALA® Wildlife Preserve also assist with providing educational programs for children. We look forward to making your next event amazingly memorable. 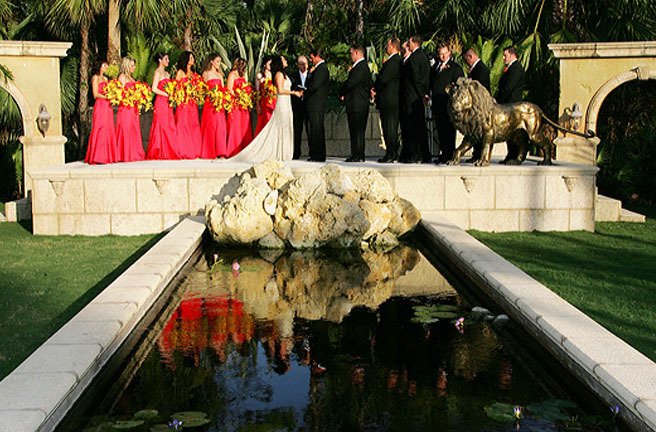 While we do offer a multitude of services, our proven process to create extraordinary events is very simple. People have loved the company of animals since people and animals were placed on the planet. Their intrigue, power, gracefulness and splendor always humble mankind and make life very exciting! 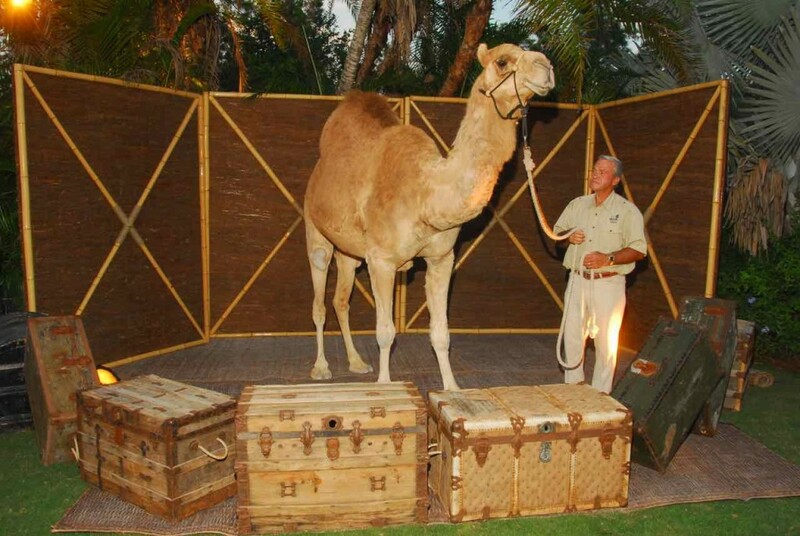 Our “living-art” displays enhance the animals’ beauty and grace while providing a safe and dignified manner of exhibiting them. This interactive experience provides an entertaining yet educational environment. Options range from alligators to a giraffe. A wide variety of creative cuisine awaits your guests at NGALA®. 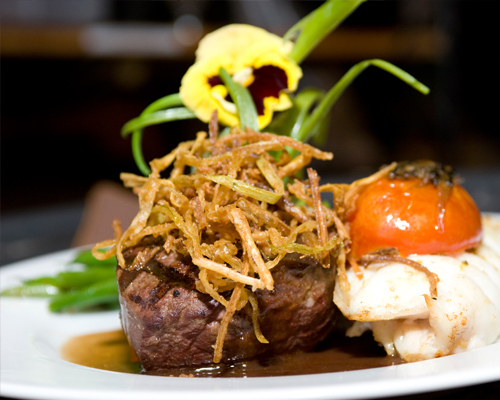 Prime Buffalo Tenderloin, succulent South African Rock Lobster Tails, Safari Ostrich Picadillo and Kangaroo Bobotie are just a few meticulously prepared options offered. All entrees are created with the finest and freshest ingredients specific to your group’s palate! Traditional fare is also available and prepared to order. Presentation is impressive. Quality and quantity are never an issue. We offer three distinct styles of service to suit the needs of our guests. Special dietary needs are also accommodated with pleasure upon request. 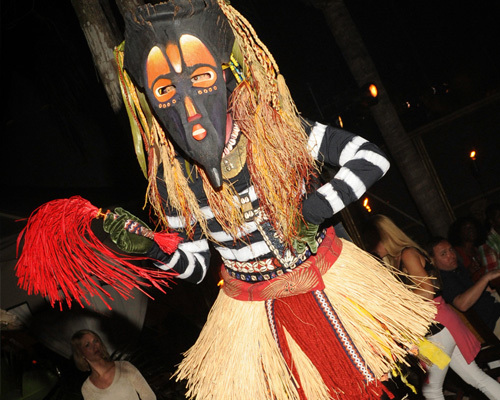 Unusual entertainment options are an integral part of the NGALA® experience. 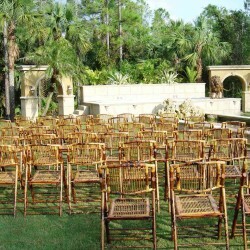 These help set the tone and enhance your event. 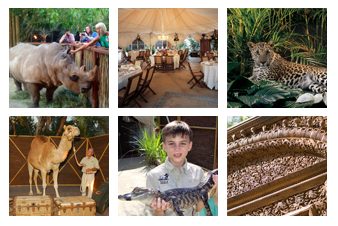 The entertainers recommended by NGALA® Wildlife Preserve are masters of their craft. They range from cigar rollers to living orchids, to masterful musicians. Many of these performers represent various destinations from around the world. NGALA® has been created to accommodate the needs of groups ranging from twenty to one thousand guests. 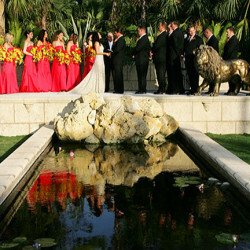 For smaller groups we have the ability to section off various intimate areas while still showcasing the amazing venue. 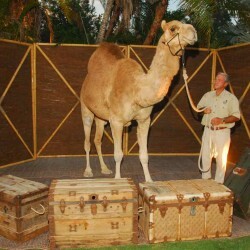 We offer additional options to accommodate the larger groups of guests. 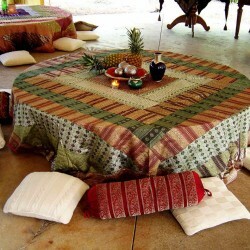 Areas such as the “Masa Mara Boma” and the “Oasis Lawn” can be utilized for a combination of purposes. 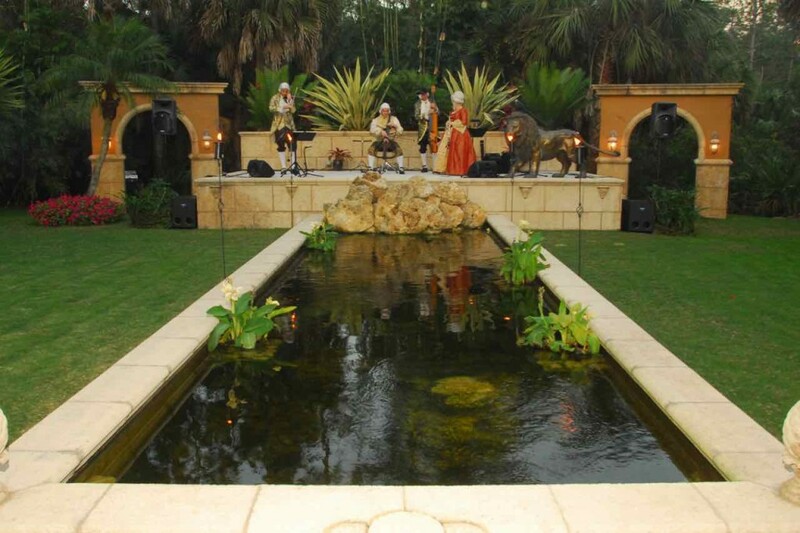 Combine these with the “Cleopatra Conservatory” and the ”Moroccan Trios” and you have three tented venues which can be utilized independently or simultaneously depending on the needs of your group. 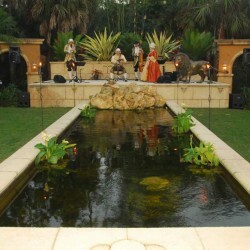 No matter how you choose to utilize our location and services the experience will be exclusive to your function! This extension of space was created by constructing of a wall of ten-twelve foot tall sticks, with various diameters staggered at various heights. The sticks are manually lashed together utilizing rope and natural materials, (a method of construction still utilized in various primitive locations around the world.) 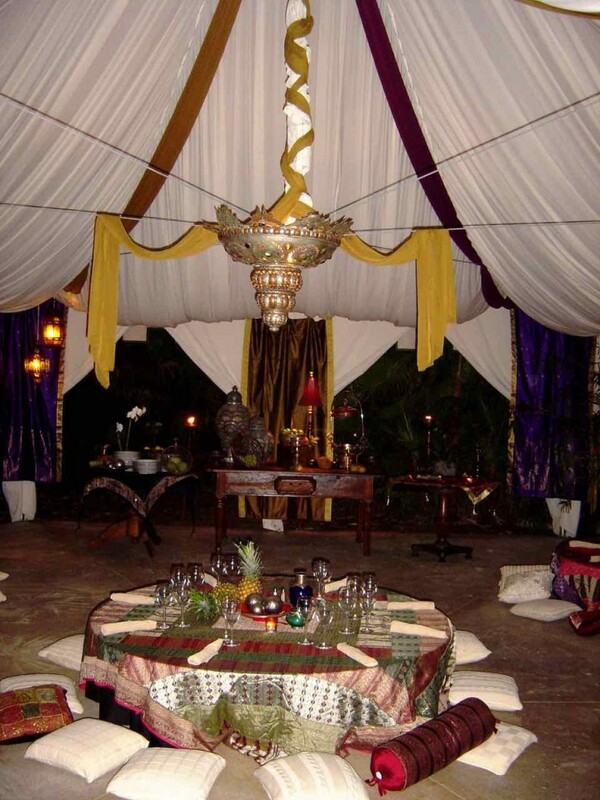 Embellished with theatrical lighting effects and enhanced with torches, lanterns, and fire pits your guests will feel like they have embarked on an expedition. 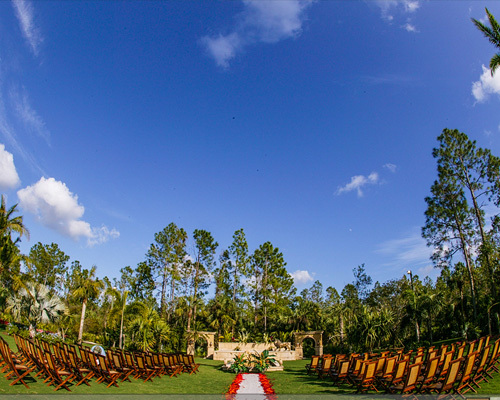 This area is provided in a “blank canvas” form and can be transformed into amazing event space. 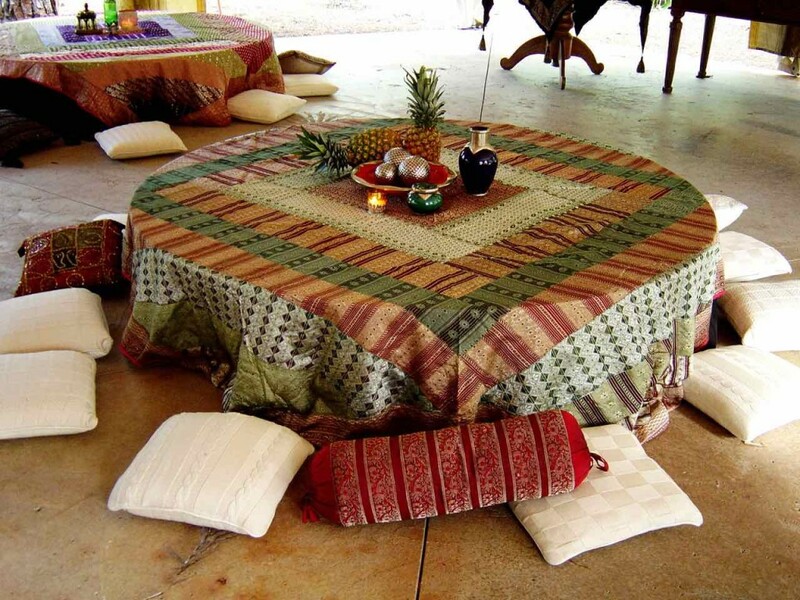 The Masa Mara Boma can be transformed in to an authentic style Moroccan Market Place which is a perfect setting for an afterglow, dessert conclusion, or reception. The Masa Mara Boma is adjacent to the NGALA® structures, the option exists to add the area as an extension or additional “flow space”, or it can be used to create a progressive event to include a myriad of services including product launches, team-building, outdoor dining, awards ceremonies, etc. 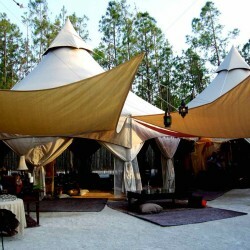 This area can also be tented with the Moroccan Trios. As you walk through the Masa Mara Boma, you notice the vividly colored sails draped overhead. Illuminated theatrically at different elevations, they create intrigue and a mysterious environment. The glow of torches and candles tantalize you as you move towards the fire pit. Hand-carved tables and cotton pillows placed on antique rugs invite you to sit, relax, recline and enjoy the mesmerizing sounds of the Sitarist as he plays his most unusual instrument. As you explore your surroundings you take note of authentic artifacts, the detail of the metal work affixed to the intricate pottery, hand-adorned copper pots, as well as reed and rattan rugs which are hand-woven. 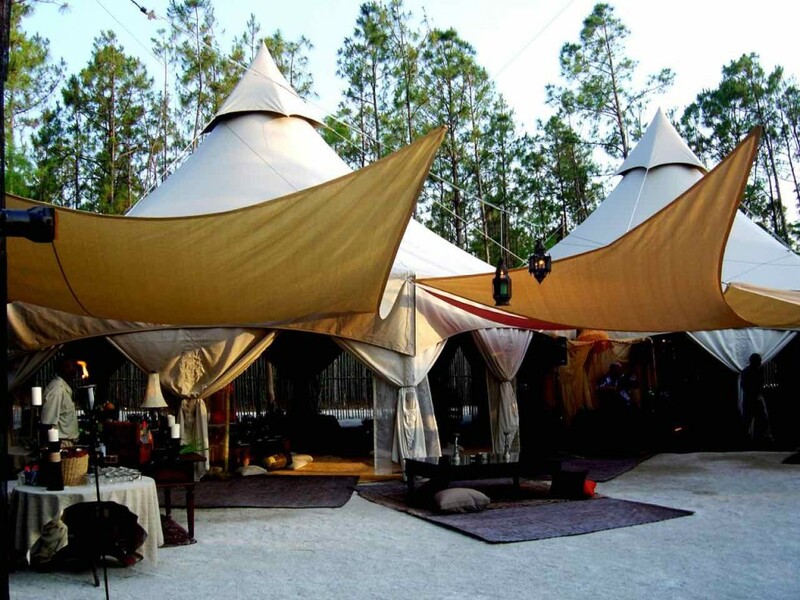 Venturing further, passing into the tent you will notice the chiffon liners flowing from the tent ceiling which is accented by a stunning chandeliers of hand-made rose copper, white cooper and glass. Resting comfortably on cotton pillows you enjoy conversations over a table draped with 100% silk, hand- crafted, antique sari cloths. Glowing candles that are placed in jeweled, rich ruby-toned votives, fresh fruit, Moroccan pottery and hand-selected trinkets compliment the décor. Moroccan lamps shimmer as you enjoy this wonderful experience. From your table you can observe Coulter, the giraffe, as he enjoys a clump of fresh-cut bamboo. Your palate sings as you dine on exquisite, aromatic cuisine. You are relaxed and completely transformed. The Oasis Lawn is an extension of the primary NGALA® venue. It was intentionally created to offer a “blank canvas style”. This means that it can be utilized with additional tenting and /or options to create a totally custom location and therefore, provide a comprehensive foundation that offers unlimited possibilities! 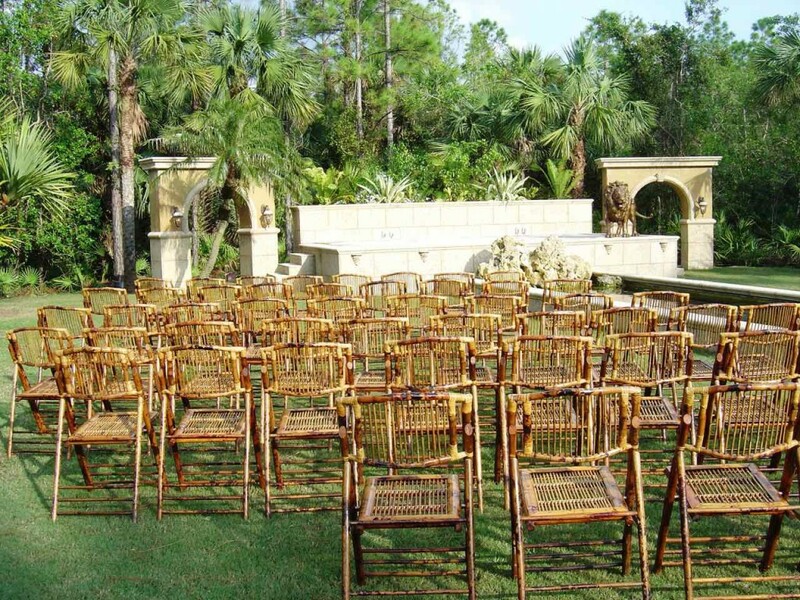 The Oasis lawn was created in a style reminiscent of the lawns located on plantations throughout the south during the grander times of the turn of the century. This Zoysiagrass lawn is surrounding by a border of natural Florida vegetation. This guests to feel the grandness of the space while at the same time appreciating the intimacy of the space. The infrastructure included 400-amp electrical service, water and easy access. The center focal point of the lawn is the “Stage of Triumph”. This stone stage with its magnificent arches provides a sense of importance, due just to the permanent “mass” created by its presence. Perpendicular to the stage is a reflection pond filled with beautiful Japanese Koi. The vivid colors of the fish are trimmed by the stone border coping around the pond create a living picture and frame. Surrounding the reflection pond and “Stage of Triumph” are a collection of rare and unusual species palms and a variety of tropical foliage originating from all over the world. 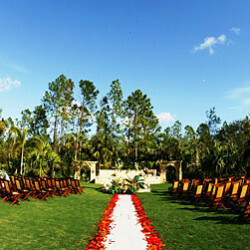 The Oasis Lawn can be utilized as a stand-alone location for a unique awards ceremony, product unveiling, team building activities, educational seminars, stage production, event space, cocktail reception and helicopter landing area. Previous clients used this area to stage “Cleopatra’s Conservatory” which transformed the area to accommodate 560 persons. Other clients opted to use our striking entry effect and cocktail reception area! Passing through “ancient ruins” guests are received by a grand structure situated on the Oasis Lawn. 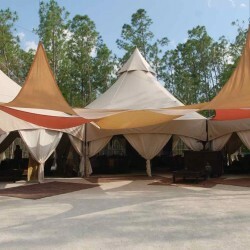 This clear tent structure is an option which can be added for an additional fee. The structure fully encompasses both “The Stage of Triumph” and the reflection pond. 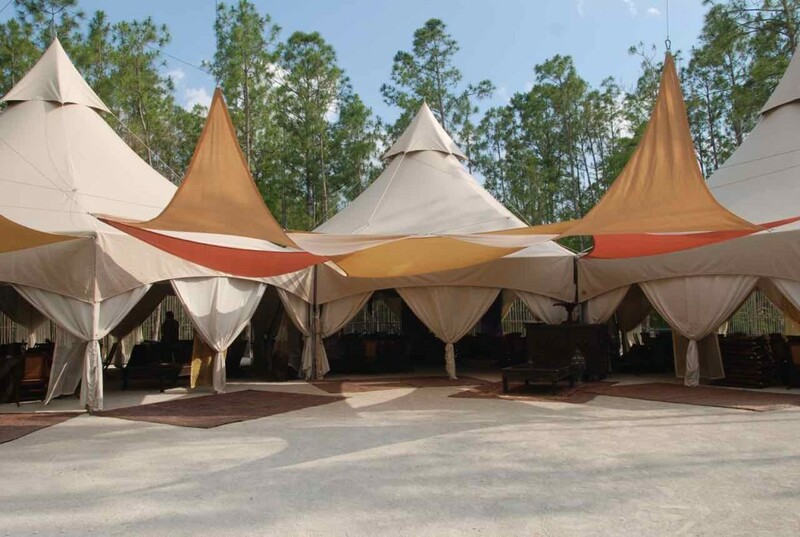 This clear structure compliments and extends the capacity of the NGALA main tents while providing an additional point of architectural interest. Guests will enjoy dining under natural stars and moonlight while enjoying the comfort of a controlled environment. 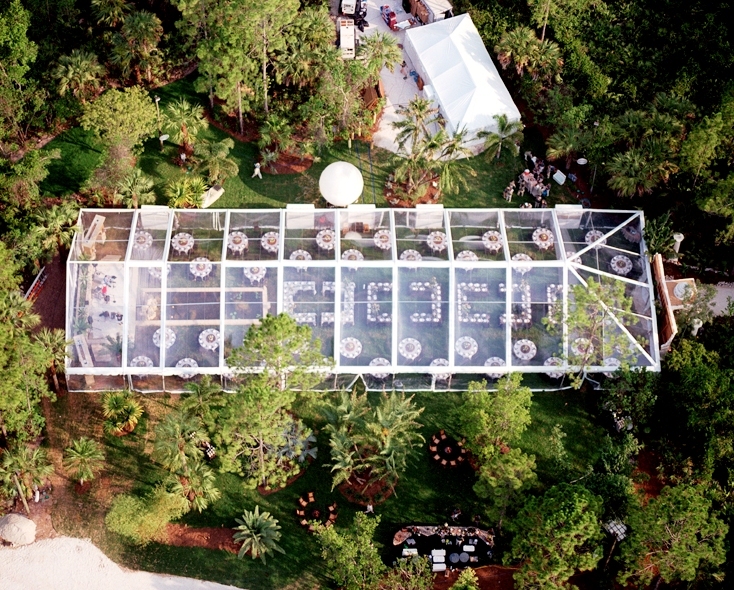 This clear tent structure can be utilized for additional dining space for a larger group. It can be transitionally used to host any number of purposes such as award ceremonies, headliner acts, theatrical productions, keynote addresses, team-building activities, product launches, weddings, or auctions. The possibilities are endless!